This metal spy hidden pen camera feel very sturdy and durable in the hand. It looks very much like an actual pen but can be used to record discreetly. The video record records 1080p at 30 frames per second in HD video DVR. It can also be used to take still pictures with a photo. All of the data from the hidden camera pen can be transferred to a computer via a USB port. This spy pen camera can be used as a USB memory stick or as a nanny cam to keep an eye on the house when you're away. 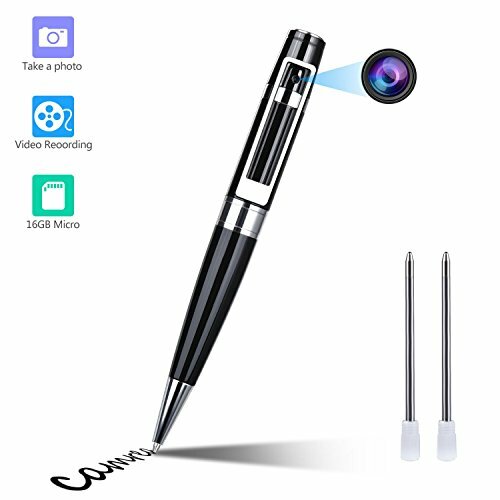 The mini pen camera is a small, but versatile tool that can be used in the home or office. 1. Please charge this hidden spy pen camera fully before fist time use. 2. This spy pen camera has a built-in 16GB Micro SD Card. Hidden Spy Camera Pen: It is the easiest to use spy pen available, with a single press of a button it powers on, boots up, and begins recording video at 1920x1080 resolution. Video and Photo Mode: You can choose between two recording modes and with a click of a button, you can take clear snapshots and video. Plug & Play: Simply plug the spy hidden camera pen into your computer, and review your recorded footage. You don't isntall any driver into PC. Date and time are optionally displayed in the corner of your video for your personal reference. This feature comes in handy if the video is needed for discovery or presented as legal evidence. One Button Operation: Easy to start/stop recording and take a photo just press one button. When the spy pen camera is recording, the LED indicator lights will be put off. Quality Warranty: 12 Month Warranty and Lifetime Support Provided.If you have any questions with this spy hidden pen camera, please feel free to contact us. If you have any questions about this product by GooSpy, contact us by completing and submitting the form below. If you are looking for a specif part number, please include it with your message.